Maize or more commonly referred to as Corn is a complex and interesting plant. 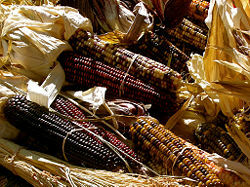 Maize has been used by man for many years and has become a very important crop and is heavily used by humans. Maize like all plants was created on the third day of Creation as referred to in Genesis 1:11-13: "11 Then God said, "Let the land produce vegetation: seed-bearing plants and trees on the land that bear fruit with seed in it, according to their various kinds." And it was so. 12 The land produced vegetation: plants bearing seed according to their kinds and trees bearing fruit with seed in it according to their kinds. And God saw that it was good. 13 And there was evening, and there was morning—the third day." Maize, like all plants, is a multicellular eukaryote with cellulose made cell walls. 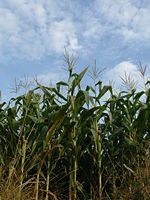 Maize and all plants carry out photosynthesis using chlorophyll. Maize plants are angiosperms meaning that they are flowering plants that bear seeds, produce fruit, and have water vascular systems. Maize plants are also monocots, because they have a single cotyledon, parallel veins, have vascular bundles scattered around inside the stem, and have fibrous roots. Maize plants are also herbaceous. Maize has xylem and phloem, because they have vascular tissue and vascular tissue is made up of said xylem and phloem. (Miller and Levine p551-583). Maize leaves can grow up to 50–100 centimeters long and 5–10 centimeters wide (2–4 ft by 2–4 in). The stems grow up to 2–3 meters (7–10 ft) in height. The internodes  can grow up to 20–30 centimeters (8–12 in). The stems grow up to 2–3 meters (7–10 ft) in height. Maize plants have two different inflorescences, or cluster of flowers, these differ with the gender of the inflorescence. The female inflorescence is the most familiar part of the maize plant as it bears the fruit of the plant and is used for animal and human consumption. The female inflorescence, called the ear, has five parts, the kernel, the husk leaf, the cob, the shank, and the silk. The kernel is the seed-bearing structure of the maize plant. The husk leaf is the outer protection of the ear, it protects the kernels of the ear. The cob is the axis of the ear. The shank is the stalk of the maize plant. The silk is the the narrow elongated part of the pistil between the ovary and the stigma of a maize floret. The male part of the maize plant is called the tassel and has four parts, the tassel branch, the tassel rachis, the tassel spikelet, and the tassel peduncle. The tassel branch is any branch that sprouts out of the primary or higher order tassel axes. The tassel rachis acts like the female counterpart, the cob, meaning that it is inflorescence axis of the tassel. the tassel spikelet is the ultimate inflorescence branch of the tassel. The tassel peduncle is the axis below the lowest tassel node. The reproductive cycle of the Maize plant has two stages, Vegetative and Reproductive. The Vegetative stage is the sexually inactive stage. The Reproductive stage is where reproduction takes place. The reproductive cycle begins when the male gives off its pollen, which contains 3 nuclei. The pollen comes off the tassel part of the Maize plant. The Maize plant uses either wind or animal pollination, so the pollen can be taken up either by the wind or an animal (Miller and Levine p615). When the pollen reaches the female part, it will fertilize it and form an embryo. The embryo is then covered with tissue until it forms a kernel. The Maize plant's tassels can be seen here. 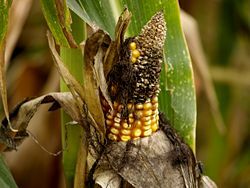 These diseases pose a problem for farmers who wish to cultivate Maize. Zea Anatomy Multiple authors. Gramene. Corn Structure and Reproduction Unknown Author. Boyce Thompson Institute for Plant Research. CORN Zea mays Unknown Author. Plant Pathology and Microbiology Texas A&M University. Maize Insect Pests in North America Multiple Authors. University of Minnesota Radcliffe's IPM World Textbook. This page was last modified on 11 December 2013, at 12:30.